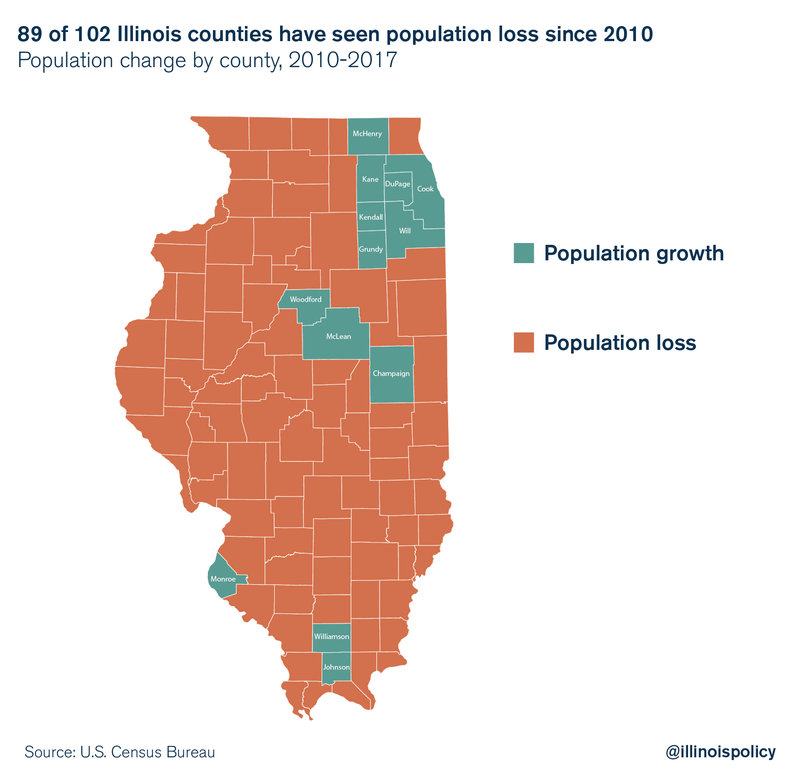 As outmigration fuels population decline throughout the state, Cook County saw the largest numeric population loss of any county in the nation. New data released today by the U.S. Census Bureau show Illinois’ concerning trends of population loss and outmigration are playing out at the county level across the state. In December 2017, the U.S. Census Bureau released data confirming Illinois had dropped below Pennsylvania as the sixth most populous state in the country, due to four consecutive years of population decline. Even more troubling was the fact that Illinois’ population loss was primarily driven by Illinoisans relocating to other states at the rate of 1 person every 4.6 minutes. The county-level data reveal 83 of Illinois’ 102 counties saw their population decline from July 2016 to July 2017. Since 2010, 89 of Illinois’ 102 counties have experienced population loss, according to the census data. Cook County saw its population decline by more than 20,000 people from July 2016 to July 2017 – the largest population loss of any county in the nation in raw terms. 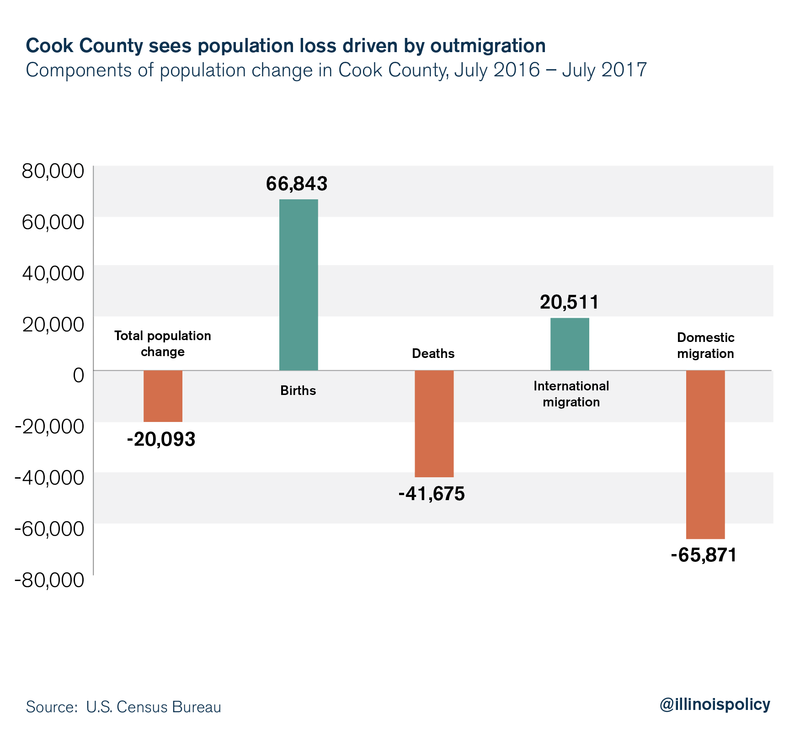 While Cook County saw more births than deaths and gained more than 20,500 people from international immigration, those gains were more than offset by heavy losses of residents to other counties. Since 2010, Illinois has lost nearly 643,000 residents on net to other states. That’s comparable to the population of Illinois’ four largest cities outside Chicago combined. Only four counties in the entire state have seen positive domestic migration since 2010: Kendall (+2,309 residents from other U.S. counties, including counties in Illinois), Monroe (+852), Johnson (+416) and Williamson (+241). 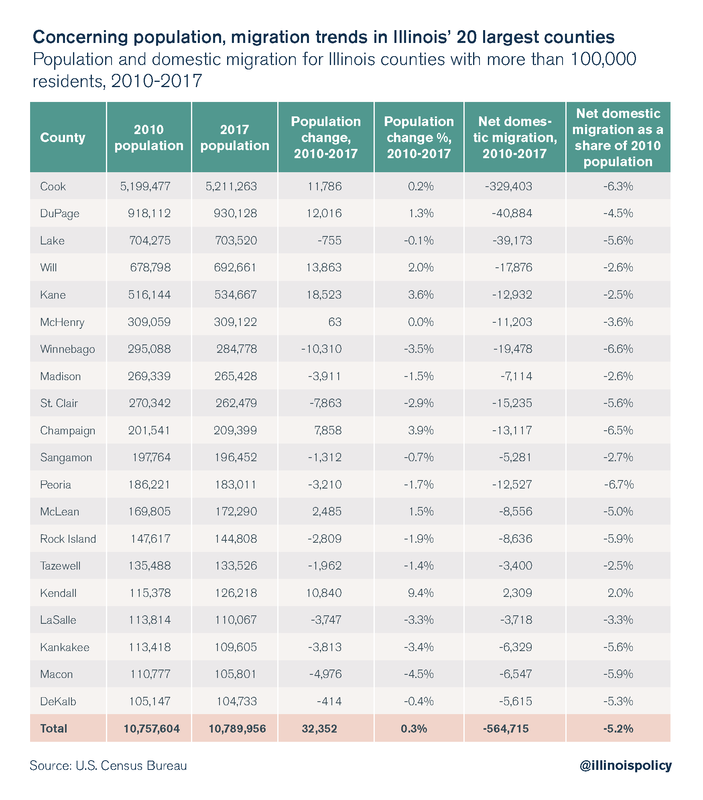 Since 2010, 19 of the 20 largest counties in Illinois have witnessed net migration losses to other counties in the U.S. Among the largest counties in the state, Peoria County has seen the heaviest domestic migration losses, in percentage terms. The home of Caterpillar Inc. lost more than 12,500 residents to other counties over that time, which is equal to 6.7 percent of the county’s 2010 population. Cook County has seen a net loss of more than 329,400 residents to other counties since 2010. At the same time, each of the collar counties experienced net losses to domestic migration as well: DuPage (-40,900), Lake (-39,200), Will (-17,900), Kane (-12,900) and McHenry (-11,200). This period of outmigration and population decline coincides with Illinois’ almost nonexistent recovery from the Great Recession. Slow jobs growth and persistent outmigration have only been worsened by poor state policy. For the last decade, Illinois state government spending has grown 25 percent faster than personal income for Illinoisans. To finance the massive increases in spending, Illinois has seen two of the largest income taxes in state history since the end of the Great Recession. The effects of the tax hikes, which are still being felt, have cost the economy thousands of jobs and billions of dollars. Now, instead of learning from past mistakes, lawmakers are considering another tax hike on Illinoisans. The General Assembly is mulling over a progressive income tax that would raise taxes on Illinoisans making as little as $17,300 and cause further damage to the state’s economy. Illinoisans deserve a state where their families can flourish and plant roots. Instead of hiking taxes on hardworking Illinoisans, the state needs to free them from their enormous tax burden. A lower tax burden would stimulate investment and job creation, making the state a more attractive place for families to plant roots. However, the only way to get lower taxes is to rein in government spending at the state and local levels. Illinois should look to states such as Virginia for ways to cut spending without harming the delivery of core services.